This set of VLSI Multiple Choice Questions & Answers (MCQs) focuses on “CMOS Logic Gates”. Explanation: In positive logic convention, the Boolean logic ‘1’ is known to be representing true state. Explanation: In CMOS logic circuit, the switching operation occurs because N-MOS transistor turns ON, and p-MOS transistor turns OFF for input ‘1’ and N-MOS transistor turns OFF, and p-MOS transistor turns ON for input ‘0’. The networks are arranged such that one is ON and the other OFF for any input pattern. 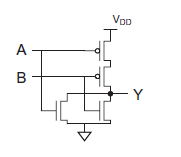 Explanation: When both pull up and pull down transistors are OFF, the high impedance for floating Z output state results. Explanation: The crowbarred (or contention) X level exists when both pull up and pull down transistors are simultaneously turned ON. Contention between the two networks results in an indeterminate output level and dissipates static power.